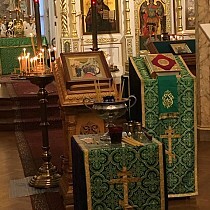 On Tuesday the 11th and Wednesday the 12th of September – the feast of the Translation of the Relics of the Holy Right-Believing Great Prince Alexander Nevsky – Metropolitan Hilarion of Eastern America & New York led the All-Night Vigil and celebrated Divine Liturgy in St. Alexander Nevsky Diocesan Cathedral in Howell, NJ, in honor of its patronal feast day. Singing the All-Night Vigil and Divine Liturgy was the St. Alexander Nevsky Male Choir under the direction of Maestro Vladimir Gorbik (Conductor of the Holy Trinity-St. Sergius Lavra Representation Church in Moscow) and Alexandra Lukianov (cathedral choir conductor). 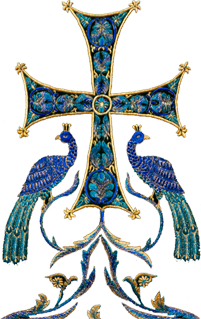 Vespers on Friday of the 5th week of Great Lent, Matins with the Akathist to the Mother of God, and sermon by Head of the Russian Ecclesiastical Mission in Jerusalem Archpriest Valery Lukianov. This recording was made on April 18-19, 1986 in the Holy Ascension Mount of Olives Convent in Jerusalem. On Saturday the 23rd and Sunday the 24th of December, Archbishop Gabriel of Montreal & Canada led the All-Night Vigil and Divine Liturgy in St. Seraphim Cathedral at Holy Dormition Convent "Novo-Diveevo" in Nanuet, NY, co-served by Eastern American Diocesan vicar Bishop Nicholas of Manhattan, cathedral dean Archpriest Alexander Fedorowski, and visiting clergy. Over 300 people gathered for the evening service. Prior to the start of Vigil, everyone venerated the holy icons and relics of Holy Dormition Convent. The service was held under the aegis of the Protectress of the Russian Diaspora – the wonderworking Kursk Root Icon of the Mother of God. Youth participants of the conference sang the divine services. On Sunday, December 17, the feast day of the Holy Great-Martyr Barbara, celebrations were held at St. Alexander Nevsky Diocesan Cathedral in honor of the 90th birthday of the cathedral’s pastor emeritus, dean of New Jersey, and president of the Synodal Arts & Architecture Commission, Protopresbyter Valery Lukianov. At the Divine Liturgy, Metropolitan Onufry was co-served by Metropolitan Hilarion of Eastern America & New York, First Hierarch of the Russian Church Abroad, Bishop Nicholas of Manhattan, and Bishop Eusebius of Khotin, as well as parish, diocesan, and visiting clergy. Singing the Liturgy was the cathedral choir, under the direction of Alexandra Lukianov. On Sunday, July 28, the All-Diocesan St. Vladimir’s Day Celebrations were held at St. Vladimir Memorial Church in Jackson, NJ. The celebrations were organized by the Eastern American Diocese of the Russian Church Abroad, and dedicated to the 1025th anniversary of the Baptism of Rus’ and the 75th anniversary of the church’s founding. Clergy who came to the celebrations from America, Canada, Russia, Ukraine, and Belarus greeted His Eminence Hilarion, Metropolitan of Eastern America & New York, First Hierarch of the Russian Church Abroad. The archpastors, clergy, and multitudinous pilgrims piously greeted three wonderworking icons of the Mother of God that have graced the celebrations with their presence: the Kursk Root Icon, the myrrh-streaming Hawaiian Icon, and the Pochaev Icon. On Saturday, October 13, in Garfield, NJ’s magnificent Orthodox church, consecrated in 1984 to the Three Great Teachers and Hierarchs of the Church ‒ Basil the Great, Gregory the Theologian, and John Chrysostom, the joint pastoral conference of clerics of the Eastern American Diocese of the Russian Church Abroad and the Moscow Patriarchate in honor of the 5th anniversary of the Reunification drew to a close.